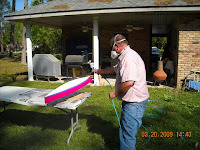 On Friday I finally had the time and the weather was right for spraying on a coat of Clear coat on the hull. 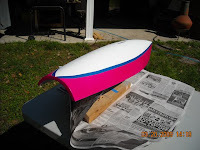 Below is a photo of the hull prior to the clear coat being applied. 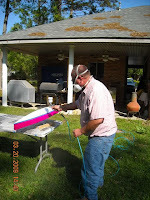 Below, I am spraying the clear coat on the hull. With Al's guidance I think my 1st time spraying this product came out pretty well! I only had two places where the clear coat ran. I have a lot of sanding to do to smooth the hull nice and shiny so these drips or runs will be sanded down.